The Featherbacks or Knifefishes (Notopteridae) (meaning "back fin") are a family of bony-tongues Osteoglossiformes. The bony-tongues are a primitive but highly successful family of fishes which have been on earth for 200 million years or more. Their shape gives them their common name Knifefish and the other popular common name Featherback comes from the small thin protruding dorsal fin (see image right) which is not always so distinct or present in all species, hence the common confusion of some being named Featherback and some Knifefish and vice versa. The smallest of the Notopteridae family is the Ghost Knifefish (Notopterus notopterus) and most common in Thailand. 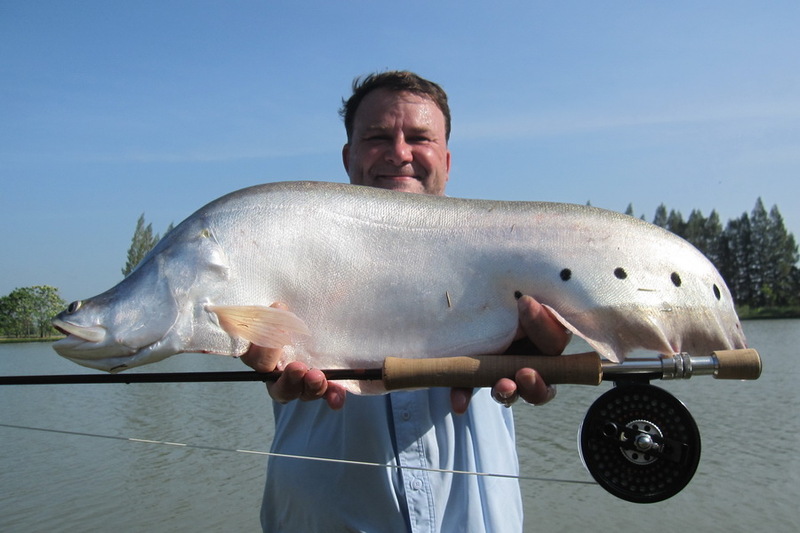 The main interest for anglers are the largest of the family the Giant Featherback (Chitala lopis) the Spotted Featherback (Chitala chitala) and the rare Royal Knifefish or Indochina Featherback (Chitala blanci). Featherbacks are usually nocturnal hunters and mainly feed on fish and amphibians. They can be taken on lures and flies which are presented well with a slow retrieve. Worms as always are a very good bait for all species of Featherback.